Baby will enjoy fun bath time ‘reading’ with this delightful waterproof bath book featuring bright pages filled with aquatic creatures. Features: Cute colourful characters on each page and a surprise squeaker inside one of the pages. Floatable bathfun designed to make bath time fun, easy and safe. 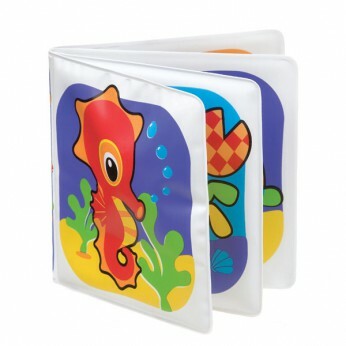 Features squeaker and padded pages to encourage hand movements and auditory stimulation. Bright colours with attractive design. This toy costs approximately £2.99 (for the latest and best prices make sure you check our retailer list for the Playgro Bath Splash Book above). In our review of Playgro Bath Splash Book we classed it as being suitable for ages 0 to 11 months but recommend you check the manufacturer specific advice before purchasing.